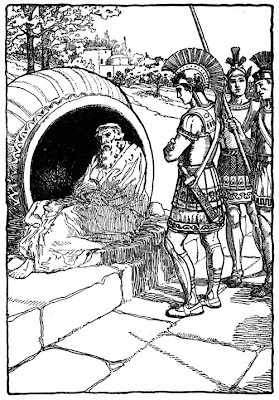 Diogenes was Greek philosopher who lived in the fourth century BC. He advocated a life of sobrietry and of virtuous action. The story goes that Alexander The Great was a great admirer of him and that he traveled a long distance to meet the philosopher. When Alexander met him, Diogenes was sitting on the ground enjoying the sun. Alexander told the philosopher how much he admired him and asked him: "Tell me what you want and I will gladly give it to you." The philosopher replied: "Yes, stand out of my sunlight." This story reminds me of what happens in solution-focused coaching. At least part of what happens in solution-focused coaching seems to be to keep from getting in the sunlight of our clients.